Ghana's Grace Amey-Obeng, one of West Africa's most successful businesswomen, made her fortune promoting products which emphasised the beauty of the black skin, at a time when many of her competitors were selling dangerous skin-bleaching formulas. The business empire she started a quarter of a century ago with around $100 (£63) now has an annual turnover of between $8m and $10m. Her FC Group of Companies - which includes a beauty clinic, a firm that supplies salon equipment and cosmetics, and a college - has eight branches in Ghana and exports to Nigeria, Burkina Faso, Togo, Ivory Coast, Switzerland and the United Kingdom. Mrs Amey-Obeng has won dozens of accolades and industry awards for her skincare beauty products and marketing. 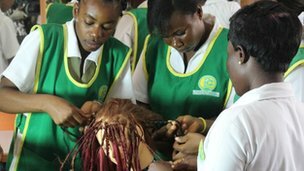 But one of the things that make her especially proud is her FC Beauty College which, since its opening in 1999, has trained more than 5,000 young people, mostly women. "It's like a family bond. I'm so proud that they have managed to go through the programme," she told the BBC's series African Dream. Equally important to her is her role as a medical aesthetician and she cites seeing a skin condition resolved as something that gives her "joy". "I'm so happy that God has given me that talent and that touch to heal people," she said. 'Irreparable damage' Mrs Amey-Obeng studied beauty therapy in the United Kingdom and after graduation, in the 1980s, returned to her native Ghana. She knew that in her country women take great pride in their appearance and was convinced that there was a niche market she could "tap into". Working out of her bag and going from house to house she advised people on skincare. Soon, however, she became aware that there was "a lot of skin-bleaching going on", a trend she found "alarming" and something that is common in much of Africa. "The women in the market had destroyed their skin with all this kind of beauty products, bleaching products, and so I saw the need for assisting them to reverse the process because otherwise it would become a social problem," she said. "The level of damage - in this climate - bleaching does is irreparable," she added. Not long after her return to Ghana, she opened her first beauty clinic with financial support from her family. "I couldn't access any funds from the bank. I didn't even think about it because everybody said 'In this country nobody will give you money'". Business loan offers came pouring in only after her business had been running for three years. Although access to bank loans in Ghana might be relatively easier these days, she advises that budding entrepreneurs should take care not to borrow too much. 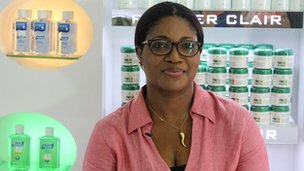 Made in Ghana Mrs Amey-Obeng explained that, once her clinic was running, she realised that the imported products they were recommending often proved too expensive for their clients. This was often a result of currency exchange rate fluctuations. "It was a challenge. They would come back with worse conditions, and so we said: 'OK, why don't we start our own line that we can sell to our people?'". Her skincare line, which she started in 1998, would soon have a huge success not only because of the products' prices - which currently range from $3 to $15 - but also, in her opinion, because they were made taking into account black skins and the West African climate. In view of her concerns about skin bleaching, the name of her brand, Forever Clair (Clear), may seem controversial to some. However, she argues that "clair" there refers to "light, hope and strength", not skin colour. "Light shows the way. It's not about complexion, it's about the heart," the entrepreneur said. And she seems indeed bent on helping others to gain hope and strength. She is well-known in Ghana for her philanthropic work, especially through the Grace Amey-Obeng International Foundation. Women leaders, she says, should offer a helping hand to less fortunate women, encourage them and share expertise. "The joy of putting smiles on the faces of people that this business offers, that's what makes me want to do it forever." I am the most good looking black woman. DO YOU AGREE? Why are white (girls) generally seen as being more attractive? Do female singers need to take there clothes off to sell there music? Why do females bleach their anuses? Why do white woman want features associated with black woman?